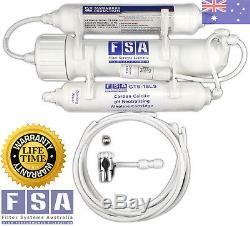 Portable Reverse Osmosis Water Filter System WITH ALKALISING FILTER (1-70CC). Portable Reverse Osmosis Alkaline Water. Removes Fluoride, Heavy Metals, Chlorine & Chemicals. Compatible with standard kitchen taps. NEW Portable Alkaline Reverse Osmosis Water Filter System. The GT1-70CC Portable Alkaline RO system features our EXCLUSIVE Carbon Calcite combination cartridge designed to reduce cost and size, at the same time providing healthy pH neutral filtered water. This day and age we realise the importance of drinking Alkaline or at the very least NON ACIDIC water. Most conventional RO systems only include a post carbon filter for taste and neglect the additional minerals required in the water to produce safe drinking water. On the opposite end of the spectrum you may already have had a glance at some of the outrageous prices some companies sell their "Alkaline" filters for. Filter Systems Australia now offers this compact, easy to use Portable RO filter that includes an Alkaline filter without the need for additional cartridges at extra costs. While we still stock standard RO filters for those who specifically require low pH de-mineralised water for other purposes not related to drinking water, we still offer these. Compact Design - Minimise Space for Both Use and Storage. Plug And Play - Connects Straight to any standard Kitchen Tap (22-24mm). 2 in 1 Carbon/Alkaline Post Filter. Low Waste Water - Averaging 1:1 on average municipal water quality & Pressure. Pure Water, Removes all the garbage including: Fluoride, Heavy Metals, Chlorine, Chloramines & VOC's, Hardness & Inorganic Mineral Contamination. Healthy Alkaline Water - How Nature Intended. Produces approx 190L/Day (Per 24hr). Our Thoughts On Water Fluoridation. Fluoride is a hot topic all across Australia and the entire world. Unfortunately, whether or not you agree or disagree with the. Fluoridation of Drinking Water, It Is There! Reverse Osmosis Water Filtration is the safest and most effective solution to remove Fluoride from your drinking water. Fluoride is a proven neurotoxin shown in countless credible studies in the US. The claimed dental health benefits are irrelevant compared to the known and proven correlation between. 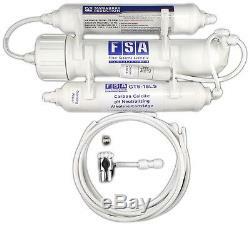 Reverse Osmosis water filtration is able to remove Fluoride from the water as it is a. Mineral salts will pass straight through standard filtration however the 0.0001 Micron RO membranes are able to remove Fluoride along with other impurities in the water. Why Some People Say'RO Water is BAD. Reverse Osmosis water filtration comes with an ongoing debate in regards to the statements RO water is too pure" and RO removes minerals that are beneficial to health" Both of these statements are deceptive and to the everyday person sounds like fact, but please let us explain both of these statements. The misconception being water that is Too Pure is all to do with the pH of the water (although the experts will state things much more dramatically). Water that is too pure simply is water that contains little to no minerals and impurities. However, this can leave the water acidic which is not ideal for drinking. The Solution is to use an alkalising filter. In fact, minerals are only valuable when they are IN our bodies, and the way they get there is through organic food intake - not inorganically. Water Filtration uses Inorganic methods, so any mention of "re-mineralizing" the water through water filtration is simply not a process that is benefiting our bodies at all. More of which will be explained later. A study in the US (which cost manufacturers many millions of dollars) showed a massive increase in total dissolved solids (TDS) in patients urine, when drinking water with a pH of below 7 i. The two main culprits for water having a pH of lower than 7 are: 1. Water Distillers for drinking water Other substances causing a low pH are soft drinks and alcohol. Once minerals are extracted from water, the chemistry of water adjusts violently to become acidic. This happens because the buffers in the water that generally act to prevent this adjustment have been removed. An interesting fact is that rain water that is near pure is also very acidic until it reaches the ground once it reaches the ground it begins to dissolve minerals from the earth, this in turn balances the pH (the chemistry of the water). Many very clean catchments such as roof tops and clean gutters, first flush diverters and poly tanks are extremely good at keeping water clean - however a trade-off for this is that the water could and most often does remain acidic. If you have a dirty roof or a contaminated tank, the pH will rise and no longer be aggressive (acidic) but at a price such as through other peripheral problems like fermentation of organics etc. Back onto the topic at hand, its important that we make a stand and explain that there are no such thing as valuable minerals in drinking water unless they are organic, and organic materials are generally not used for correcting low pH water. Almost all (barring a couple of exotic and expensive alternatives) pH Neutralising cartridges are made from inorganic material like rock (commonly known as mineral stones). These inorganic materials release either calcium or magnesium into the water, however these types of minerals are inorganic, not organic - so it's difficult for the body to absorb them or make any use of them at all. So, in a nut shell, the words'valuable minerals' is not relevant to post RO pH correction. To produce non-acidic water we need to add back some mineral, this is where the misconception arises. These are non organic minerals >>> therefore not valuable to your bodies health, but valuable in the fact that it's achieving a balanced pH- which is vital to your health. Height: 10cm Width: 35cm Length: 25cm. In cases where a PO box, Parcel locker or any other Australia Post Service is provided, we will have to use Australia Post who have a wider range of parcel restrictions. Filter Systems Australia enforces strict dispatch protocols to avoid human error where possible. Orders are thoroughly checked and signed off, carefully packed to minimise chance of transit damage then recorded manually into a hard copy dispatch manifest. All orders MUST be checked for damage within 48 hours of being signed for as delivered (based on tracking details). Please note that the above estimates are taken directly from Australia Posts Business Customer Information. If you require your item ASAP this is something you should select. Only provide an ATL on orders when there is a safe place for items to be left. We work with food grade certified materials that must be un-opened and un-used as to meet the conditions of resale. All orders MUST be checked for damage within 48 hours of receiving the parcel as stated from the tracking information provided from the courier/post company. Any contract of sale, order, or quotation made or accepted by or on behalf of Filter Systems Australia is subject to these terms and conditions of sale. Filter Systems Australia warrants each new product to be free from defects in material and workmanship for a period of 1 year from the date of retail sale established by the date of the original invoice issued by FSA. Any damage caused during or as a result of transit will not be the responsibility of FSA. The date and by whom the product was installed. The location where the product was installed. The date and time the product first appeared to malfunction. The nature of the problem with the product. The date and time of any and all loss event/s. The date and time Filter Systems Australia was first notified of the product malfunction. Product damage results from water hammer, freezing, neglect or is not installed by a licensed plumber in accordance with the installation plan. The water temperature exceeds 38° Celsius. The system is not installed with an Australian Standards approved Pressure Limiting and Dual Check Valve. Join now to receive latest updates & exclusive offers from Filter Systems Australia. The item "Portable Reverse Osmosis Water Filter System WITH ALKALISING FILTER (1-70CC)" is in sale since Friday, November 21, 2014.